Lok Sabha Elections 2019 are scheduled in seven phases. The BJP, SP, Congress and BSP, among other parties are leaving no stone unturned in pitching for their respective candidates for the second phase of polls which is to be held on April 18. LS Polls Live: UP CM in Amroha, earlier today: “Jin logon ko Saharanpur mein doosri baat yaad aati thi, vo bhasha doosri sabha mein kya badli ki vo keh rahe hain Bajrangbali to hamare bhi aaradhya hain,hum bhi unki sharan mein hain, teesri sabha hogi vo aapko kahenge,’hum aapki sharan mein hain”. 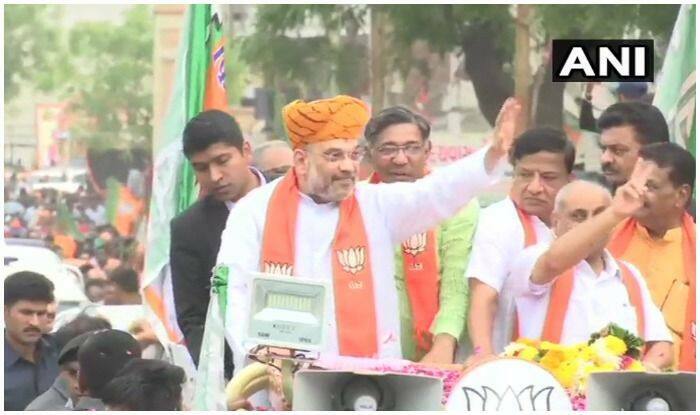 LS Polls Live: Gujarat: BJP President Amit Shah conducts a road show in Gandhinagar’s Kalol. LS Polls Live: When they committed the second mistake in Pulwama, we entered their home and conducted airstrike. “Udhar walon ko bhi samajh mein aa gaya hai ki agar teesri galti hui to lene ke dene padd jaenge,”says PM Modi. LS Polls Live: “What used to happen earlier? Terrorists used to come from Pakistan, attack us and Congress government used to cry before the world that we’ve been attacked. But this is new India. When terrorists attacked Uri, brave soldiers of the country conducted surgical strike there,” PM in Moradabad. LS Polls Live: Today the environment in the country is such that NDA will get 350 seats and BJP will get 65+ seats in Uttar Pradesh as Congress-SP-BSP are not together there, there is fragmentation of votes. So, BJP will automatically be benefited, says Union Minister Ramdas Athawale. LS Polls Live: Modi’s mission is to remove terrorism, corruption and poverty: PM Modi in Aligarh. LS Polls Live: “The country is in danger. To save the country from Modi Ji and Amit Shah Ji’s ‘Jodi’, we are ready to do whatever is needed. Our efforts will continue until the end”: Delhi CM Arvind Kejriwal on if discussions on Congress-AAP alliance are still underway. LS Polls Live: “Ye Baba Sahab Ambedkar ke samvidhaan ki taqat hai ki aaj vanchit-soshit samaj se nikal kar desh ke rashtrapati pad par ek sajjan baithe hain, gaon kisan ke saamanya parivaar se up-rashtrapati pad par koi baitha hai”: PM in Aligarh. Lok Sabha Elections 2019: Prime Minister Narendra Modi on Sunday addressed a poll rally in Jammu and Kashmir’s Kathua district and hailed the residents of Jammu and Baramulla for coming out in huge numbers and voting in the first phase on April 11. He also took a jibe at Punjab CM Amarinder Singh, alleging that he boycotted to attend the Jallianwala Bagh Centenary event on Saturday in Amritsar with Vice-president Venkaiah Naidu because he was busy in ‘Parivar Bhakti’. In the afternoon, the Prime Minister will head to Uttar Pradesh’s Aligarh where he is to address a gathering at 2.30 pm. Later in the evening, PM Modi will hold a public rally at Moradabad around 4.30 pm. Home minister Rajnath Singh will also be addressing a rally in Nagina, Aola, Agra, Fatehpur Sikri on Sunday, April 14. Meanwhile, Samajwadi Party (SP) chief Akhilesh Yadav will address a rally in Rampur in favour of party candidate Azam Khan at 2.30 pm. His ally and Bahujan Samaj Party (BSP) supremo will be addressing a public meeting in Janjgir of Chhattisgarh at 12.30 pm. The Lok Sabha Elections 2019 are scheduled in seven phases. The voting for the first phase was held on April 11. The constituencies in the last phase will vote on May 19. The counting of votes will be conducted on May 23.